They're biologists, theologians, artists and philosophers. They come from every walk of life, every corner of the country and sometimes from around the world. They are distinct, even on a common Waco campus, separated by academic discipline, life stage and aspirations for the future. Yet, they are connected; united in the common pursuit of an advanced degree--each on their way to the title "doctor"--as masters of their respective disciplines. They join a collective intellect, a diverse 33 doctoral programs among them. They have chosen a university where they are mentored by world-class faculty inside state-of-the-art facilities, including the Baylor Research & Innovation Collaborative (BRIC) and the 500,000-square-foot Baylor Sciences Building. 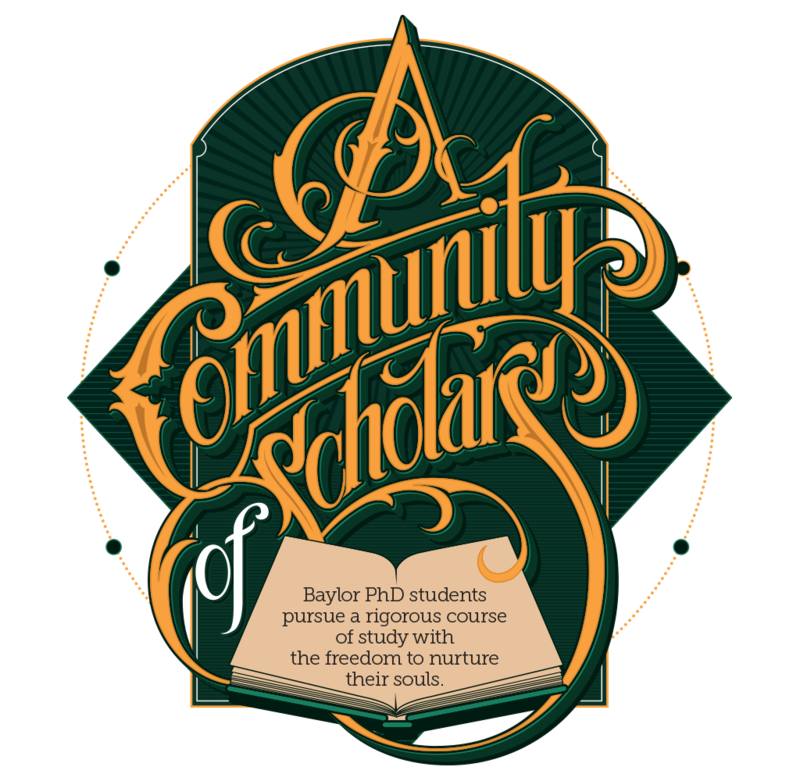 In choosing Baylor, they also have found a community of scholars unlike any other--one that stimulates the mind while nurturing the soul. Dr. Larry Lyon, vice provost and dean of the Baylor Graduate School, makes the equation sound simple, but there is an intricacy involved in "recruiting the very best students, molding them into the very best scholars and graduating PhDs equipped for leadership on the global stage." Guided by Pro Futuris, Baylor's strategic vision, Lyon and the Graduate School are tasked with a battery of demanding and specific criteria related to the University's research activity, teaching methods, doctoral production and graduate placement, along with Baylor's trademark transformative education experience. One key measure of progress according to Pro Futuris is reaching "very high research activity" status according to the Carnegie Classification of Institutions of Higher Education. The Graduate School is focused on reaching this goal with the increased production of research doctorates granted in STEM (science, technology, engineering and mathematics), humanities and social sciences programs. Already, Baylor is on the rise. 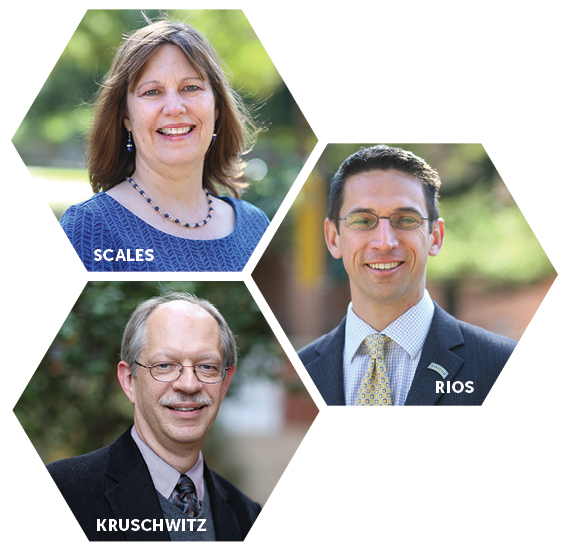 Third-party Academic Analytics, a leading provider of data intelligence on research universities, ranked four of Baylor's graduate programs among the nation's strongest in 2007. Just six years later, that number grew to 11 ranked programs in 2013. "What we have [in Pro Futuris] is the opportunity to persuade the larger academy and world that being Christian doesn't mean being mediocre in your scholarship" Lyon says. "We're not measured by different metrics [than public institutions], and we don't want to be. When Art Briles plays football, Baylor doesn't get an extra touchdown because we're Christian. By the same logic, we expect our secular counterparts in the academy to judge us as equals, as scholarly contributors to the national conversation." Strong collaboration inside the Graduate School is also evident as Baylor increases opportunities for students to engage in research with faculty. The 2013-14 academic year saw more than 500 research-driven presentations by Baylor graduate students given nationally at a variety of professional conferences. "At the highest levels, one's quality of education is almost always the result of a mentor-mentee relationship, and for this reason there is always the potential for exploitation," Lyon says. "I am persuaded that because we do have a faculty of committed Christians, we are especially receptive to being supportive, nurturing, guiding mentors to our graduate students instead of taking the 'what’s in it for me' approach." Those mutually beneficial relationships add to the transformational richness of the Baylor student experience. Retention rates reflect the positive experience students find at Baylor as the University graduates its PhD candidates at a rate 22 percent higher than the national norm. Baylor students also are stepping up as equals post-graduation. In the incredibly competitive higher-education job market of recent years, Baylor graduate students achieve a 6 percent higher "early employment" rate at the time of graduation compared with the overall national average. The Graduate School's survey reveals that, since 2007, 97 percent of PhD, EdD and PsyD graduates have found employment, with 87 percent landing in full-time employment in research, in industry, in private practice or in the academy. "Baylor has responded to the tight job market in exactly the way anyone who knows Baylor would predict," Lyon says. "Our faculty make sure they recruit the best and brightest among our applicants--those who best understand and are most compatible with our mission. Then, they provide them with challenging, individualized instruction that allows them to achieve at the highest level, and the result is a graduate who possesses clear evidence of strong teaching credentials and solid research accomplishments. "A résumé that lists higher levels of teaching experience, research grants and scholarly publications can get our student a job interview, and [because of the Baylor difference] they knock that interview out of the park," he adds. Achieving teaching experience might be viewed as counterintuitive to the University's historic commitment to the highest quality undergraduate experience as growing graduate programs lead to an increasing number of graduate students in front of the classroom. Lyon notes that the University should continue to have pride in the quality of undergraduate teaching and in graduate students who can provide quality instruction that meets the high standards set by our faculty. Baylor's Graduate School proves its model is working, as undergraduate assessments indicate students are as likely to say they "learned a great deal" from a course taught by a graduate student as a faculty member. The program stresses that undergraduates taught by graduate students in the classroom or laboratory receive instruction equivalent to the high standards maintained by Baylor faculty. "We [knew] that with the right kind of graduate students and the right kind of training, our [students] could excel in teaching undergraduates," Lyon says. "Their relatively young age helps them to relate to their students and serve as role models for them." To help accomplish excellence in teaching, graduate students have access to a wide menu of pedagogical training opportunities, including workshops, seminars and a teaching capstone program. Under the direction of Dr. Laine Scales, associate dean for graduate and professional studies, Baylor developed a program in which students practice college teaching skills while receiving feedback. In addition, each year the Provost's Office recognizes graduate students who have demonstrated exceptional skill at undergraduate teaching with awards and other training opportunities. These attributes are many of the reasons distinctively talented scholars choose to come to Baylor, but many of these points could also be claimed by any number of graduate programs across the country. Students at Baylor are prepared with the credentials needed for a successful career, while also having the opportunity to cultivate their Christian faith. "One of the things that attract very bright PhD students to Baylor is that they don't have to hide or be defensive of their faith," Lyon says. "It is an extremely rare initiative for a university with the financial and human capital infrastructure [of Baylor] to make this intentional, unapologetic faith commitment." 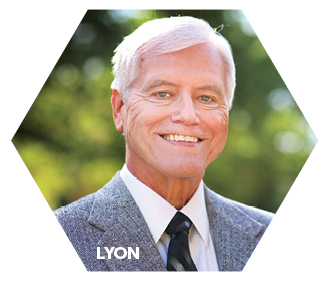 Not surprisingly, Lyon is equally a champion for the Graduate School's ever-rising academic reputation and its responsibility to stoke a spiritual fire in its outstanding scholars. With a deep belief in the importance of raising up students with a vibrant faith, he isn’t satisfied with Baylor playing the typical stepping-stone role of many other Christian universities. "They come to a faith-based school for their undergrad degree, then leave for advanced study at the Ivy Leagues," he says of many high-caliber students who choose Christian higher education. "There's nothing wrong with that model, but the Baylor model is different. We’re out to dispel the notion that Christian education can't cut it at the highest levels. Of course, we want a chemistry PhD [candidate] from Baylor to know as much chemistry as anyone else and to have as many externally funded projects as anyone else. Our differentiator, though, is their ability to discuss intelligently, with nuance and sophistication, the relationship between their walk with Christ and their profession. Along with their disciplinary expertise, we want PhD students" spirituality to grow here." Sungshil Kim, an international student of Korean heritage, grew up a missionary kid, mostly in the Philippines. As a biologist, she's interested in researching West Nile virus and hopes one day to return and make a difference in the eradication of the disease. Her parents' deep faith roots took hold in Kim at a young age, and though modest in the admission she could have chosen to study just about anywhere, she says she picked Baylor for one intentional, critical reason. "Baylor was the only school that aligned with all the things I was looking for," she says. "It's a place I knew would support me in utilizing what God has given me, to the best of my ability. I've never made a distinction between being a scientist and a Christian, but not everyone can understand the two as one. For me, they just go together and have always been part of my walk with Christ." Included in a résumé robust with scholarly credentials, Kim is a member of Baylor's third class of Conyers Scholars. The program is named for the late Dr. Chip Conyers, a founding faculty member of George W. Truett Theological Seminary and a writer whose work highlights the group's curriculum year after year. Each Conyers class is an exclusive selection of 12 to 18 doctoral candidates representing a cross-section of the Graduate School. Once a month they gather for a meal and then a conversation focused on an assigned reading. Their mission is to provide a supportive, Christian atmosphere in which members can explore their faith and prepare for service in the academy. Ambitious, driven and out to change the world, Kim and her Conyers colleagues play iron to each others' iron. Although they may rarely cross paths in the classroom or lab, they gather instead during personal time to reflect on a common experience. They eat together. Talk together. Most of all, they help each other make sense of life together--the earthly and eternal kind. "Charitable reading" is what these students call it, something of a foreign concept in most graduate schools, says B.J. Parker, a Conyers alum who now serves a leadership role within the group. Conyers readings, though brief, invite the kind of thoughtfulness and intellectual intimacy seldom found in a doctoral student's typical schedule. "The way I conceptualized life as a scholar began leading to some unhealthy soul practices," Parker says of his first year as a PhD candidate. "This program gave me a new perspective on the way a person does scholarly work, even while being formed by what it means to be a person of faith." Parker credits the Conyers program for reversing a mindset that once had him on the edge of burnout. Relieved to discover he wasn't the only one struggling to find balance, he also was able to recognize and begin to change certain "dehumanizing" grad life habits he’d found himself unintentionally adopting. "I was worn down, and I had stopped celebrating life," he says. "When that happens, it pushes us away from relating to people, caring only about the numbers one can produce instead of honoring the individual as a human being. Over time, that kind of thinking shapes your soul." To use the term "rigorous" to describe the life of a PhD candidate is an understatement, at best. For a top-level performer at a high research university, as every Conyers Scholar is at Baylor, the expectation can be almost unimaginably lofty, not to mention the stakes. "We think about our motives for research: the discovery and dissemination of new knowledge," says Dr. Robert Kruschwitz, senior scholar in the Institute for Faith and Learning and a Conyers faculty leader. "[At Conyers gatherings] we ask ourselves, how would Christians think about those projects? How should they? Certainly there are plenty of ways incompatible with our lives as Christ-followers; ones that are very competitive and all about who gets there first, controls it, gets credit for it," he says. "At Baylor, it's not about using knowledge to feather our own nest. It's about coming to love the knowledge in a way that's not possessive, which encourages us to share it with others. This is not a watered-down version of scholarship, rather it’s a very potent one." Scales believes the only way to achieve this is by providing strong mentor-models who, themselves, deliberately and uncompromisingly approach their faith and scholarship as one. Her philosophy cuts to the core of biblical stewardship. "God has given us an obligation," she says. "At Baylor it's about so much more than socializing future professors. We're committed to the formation of an entire person, not by simply preparing replicas of ourselves to run universities one day but by deepening our students for a greater purpose." Scales, whose background in social work is an asset in her leadership role, has proven a trusted personal adviser to many Baylor doctoral recipients during the past decade. Baylor, she says, nurtures a unique way of respecting the knowledge of the experienced without the separation of hierarchy. "Christian relationships are integrated within student-teacher relationships," she says. "We go to church together; as teachers we're counted on for life and spiritual guidance, as well. You wouldn't find that in any number of schools where there's a line drawn between 'academic' and 'personal' life, as though you're required to live two (lives)." Scales takes that connection seriously enough to herself live among graduate students in a housing community. She points out how Baylor's three primary graduate housing complexes--Browning Square, Centre Court and The Quadrangle--are designed and function specifically to enhance a true sense of community and belonging among not only the students who come to Baylor but also the families who support their pursuits. Paul McClure says in coming to Baylor he never experienced the "indentured servant syndrome" sometimes associated with life as a graduate student. Tight-knit within his sociology cohort of five, he's found support from professors and a healthy level of accountability, not competition, among his classmates. "The Graduate School is pragmatic in the sense that [faculty] know what it takes for PhD students to succeed in the academy," McClure says. “They give us the tools and preparation to do that, but not at the expense of our personal well-being. They recognize academics as part of life, not the whole thing." Dr. Chris Rios, assistant dean for graduate studies, believes in supporting a holistic Baylor Graduate School experience and helping students work through their personal understanding of faith issues. One of his major initiatives in doing so is as faculty host of a science and religion lunch seminar series held each fall, created for and targeted toward doctoral students in STEM fields. The five-part seminar is described as an analysis of the "apparent war in which champions of science and defenders of religion battle for the hearts and minds of the modern world." "We take time to explore some of the historical issues that have led to the perceptions of conflict between science and faith," Rios says. "The goal is not to deny these points of tension but to understand how Christians over time have made sense of the issues." Along with unpacking the dense "conflict model" between science and faith, he hopes the lunch seminar impresses upon its participants a wider mindset for understanding their future professional roles. "In the greater context of life beyond Baylor, there is most definitely a value added to the world of being educated in a place that takes faith seriously," he says. "It seems to me the world is currently suffering from an inability to understand how religion shapes people’s thinking. There are great conflicts happening across the globe that are motivated in large part by the faith some people hold, and that of course includes Christianity. Examining one's own faith lends empathy to understand how faith of any kind informs a person’s thinking." Rios, who works also to integrate Baylor's spiritual life and chaplain's offices as central resources for doctoral students in addition to their traditional function supporting undergraduates, says that ultimately it is relationships that form the basis for introspective spiritual understanding. "Many of the most important realizations in a student's mind happen organically, 'unofficially,'" he says. "We want to help create opportunity for those moments--in a professor's office, church groups, small groups or just getting together as friends." As Jared Brandt works toward earning his PhD in philosophy, he finds himself persistently evaluating how faith informs his scholarly thinking. As a member of the Baptist College and University (BCU) Scholars program as well as a Conyers Scholar, he's found a safe yet challenging environment to ask vulnerable questions without judgment and receive genuine encouragement toward resolving internal conflicts. "Within our department, there's a strong sense of community that leads to a certain openness and accountability," he says. "My classmates will ask when I'm working on a project, 'How is that relevant to what you'll be doing when you’re a teacher?' Faculty members come to our department's weekly colloquiums and offer great comments and feedback. They come to our monthly potlucks. They're giving of their time, meeting with students whenever it's necessary. They really care about us as individuals, and I feel blessed to be in this sort of environment." Brandt and his fellow BCU scholars are identified by high achievement in their respective disciplines who hold exceptional potential to become leading future faculty within Baptist universities. However, like Baptist and non-Baptist graduate students around the country aspiring to professorship, Brandt faces a grimly competitive job market. Through BCU Scholars he is able to develop strong, meaningful connections with other Baptist institutions and potential future employers, regularly visiting those campuses for tours and conversation with students, faculty and administrators. "I really see Baylor as having given me this unique opportunity for preparedness of stewardship," he says. "I've experienced the chance to really live out what I'm studying, to be engaged as a teacher and to understand the responsibility I'll have in the formation of undergraduate students." Ultimately, Rios says, it's about understanding how opportunity complements the obligation set before every Christian scholar. "Our academic aspirations should always align with the command [of Jesus] to love God with all your mind," Rios says. "People who can, should be good scholars. Those gifted by God with the capacity to excel, ought to. It shows the world what loving God with all your mind means." And, Kruschwitz says, those who "can" should not only "do," but do with boldness. "Christian scholars need to understand not only that it's perfectly acceptable but that it's expected they would have certain views shaping the questions they ask, the theories they present and the way by which they evaluate options in seeking the truth," he says. "When students begin to understand that, it empowers-their research and teaching in light of their faith, and the reverse. At Baylor we practice this integration so that hopefully it will continue into their careers and rub off on other Christians around them throughout their lives." Lyon notes, "For 170 years, people have supported Baylor because they believe in a Christian university. If we're not distinctive--better, in some ways--then we didn't justify their belief. I want our Baylor constituency to see that we're doing something different in the Graduate School, and I want them to be proud of that difference."